Irvine, CA, March 8, 2010 – After a stunning success for their very first live auction in November 2009, new auction house Spectrum Wine Auctions has announced the latest in its series of online wine auctions. The next online auction, the March 2010 Online Auction Part 1, has pre-bidding underway from now until Thursday, March 11, 2010, when live Internet bidding on 204 lots begins at 10:00AM Pacific Standard Time. The online auctions, which typically take place twice monthly, feature some of the most prized wines from around the world. Spectrum has held a dozen of them since launching its wine division in July 2009. The auction also features some of the most sought-after wines in the world. For example, Lot 23, a 1er Cru Classé Margaux, is a 100-point “Parker Perfect” wine. Robert Parker’s review in Wine Advocate last June recalls, “It offers an extraordinary aromatic display of spring flowers, camphor, sweet red and black fruits, a hint of licorice... full-bodied richness that is fresh with laser-like precision... one of the legendary wines made at Château Margaux.” Another 100-point wine on offer is lot 56, a 1986 Mouton Rothschild Pauillac 1er Cru Classé. Back in 1994, Parker enthused, “... the sensational opaque black/ruby color... bouquet of minerals, celestial blackcurrants, smoky new oak, and spices. The wine possesses incredible concentration, full body, fabulous length, and is - well - perfect." One can only presume the wine has improved with age. And in addition to the French and Italian offerings, there’s a full range of California selections from boutique vineyards like Staglin Family as well as Napa Valley stalwarts like Far Niente, Silver Oak, Mt. Veeder, Spottswoode and Mondavi. The most recent auction, the February 2010 Online Auction Part 2, consisted of 184 lots featuring a fantastic parcel of Burgundy and Bordeaux and a large California collection. Some of the wines came from the collection of legendary wine enthusiast and collector Aubrey McClendon. Spectrum offers live Internet bidding through its website for each online auction enabling live bidding one hour after pre-bidding closes. Each lot will be sold, one after another, until all lots are sold. 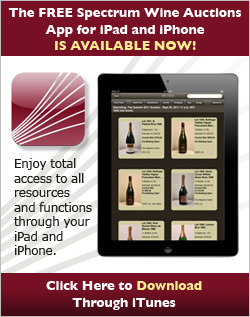 Clients can register at www.spectrumwine.com in advance and download bidding software. Many of the lots feature Spectrum’s unique 360-degree imaging system—especially valuable in an online auction—that permits bidders to rotate the bottle in space. In addition to being a visually stunning technique, bidders can practically examine fill level, labels and other features of each lot. The lots also feature Spectrum’s single auction estimate. Spectrum is also planning their next live auction for April, “The Spring Auction,” which will feature wines from The Aubrey McClendon Collection Part II and?The Historic Collection of Dr. George Primbs. As with their debut auction last November, it will take place simultaneously in Southern California and at Crown Wine Cellars in Hong Kong. For the latest details please visit www.spectrumwine.com. Spectrum Wine Auctions welcomes enquiries from consignors and collectors. Please contact Spectrum’s Director of Client Services Amanda Keston at 888.982.1982 for additional information and questions. Spectrum Wine Auctions, based in Irvine, Calif., delivers a worldwide buying, selling and appraisal venue for collectors of rare and fine vintage wines. 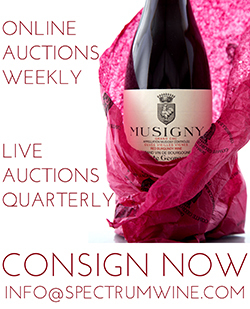 Live wine auctions in premier locations from Napa Valley to Hong Kong, as well as online wine auctions that span the globe, offer bidders and consignors alike the opportunity to collect and sell their favorite wines of the world with confidence and ease. Spectrum Wine Auctions is a division of Spectrum Group International, Inc., which includes first-class auction houses in numismatics, philately, and fine arms and militaria, as well as trading of bullion coins, bullion gold, silver and platinum to the wholesale marketplace, and financing on a wide array of collectibles, including coins and currency, bullion, and guns and militaria.